Lakeside 8702 Stainless Steel Full-Service Hydration Cart with Shelf - 44 3/4" x 25 3/4" x 38 1/4"
Whether you want to boost impulse sales at a small breakfast buffet, enhance your appearance at your next catered event, or even encouraged increased fluid consumption at your retirement community, this eye-catching Lakeside 8702 full-service hydration cart is just what you need! 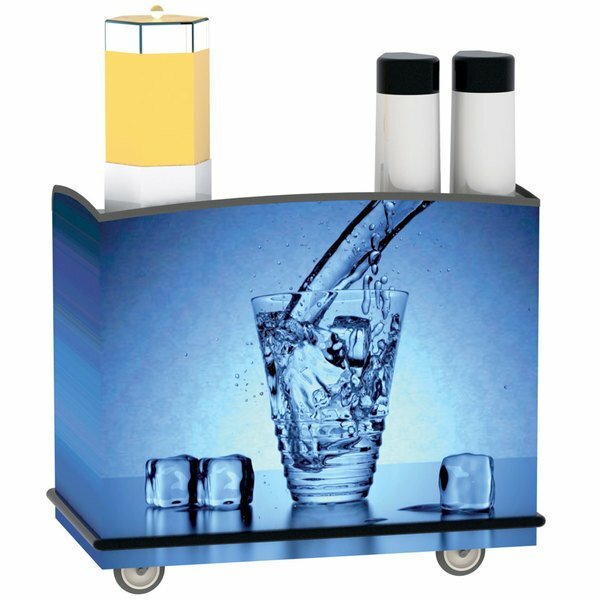 This cart allows you to load drinks, snacks, and other supplies like cups and flatware from stock and prep areas before moving it into service, eliminating the need for a dedicated serving table. Thanks to the unit's attractive edge along 3 sides of the top, it not only sports unique curves to really set it apart from others on the market, but also offers protection against items falling during transportation. Boasting a spacious interior with a fixed shelf for simple organization, this model provides you with plenty of room for discrete storage of additional service items and supplies to further boost your operation's efficiency. This cart's all-stainless steel construction ensures long-lasting durability and performance, while a continuous bumper around the perimeter helps protect your walls and furniture from damage. It also features 5" swivel casters mounted on a stainless steel dolly to make it simple to maneuver, even in tight spaces! Interior: 40" x 23 3/4" x 26"
Lakeside 8706 Stainless Steel Full-Service Hydration Cart with Adjustable Universal Ledges - 44 3/4" x 25 3/4" x 42 1/2"
Lakeside 8704 Stainless Steel Full-Service Hydration Cart with Adjustable Universal Ledges - 44 3/4" x 25 3/4" x 38 1/4"
Lakeside 8708 Stainless Steel Full-Service Hydration Cart with Adjustable Universal Ledges - 44 3/4" x 25 3/4" x 42 1/2"
Overall User Rating: Lakeside 8702 Stainless Steel Full-Service Hydration Cart with Shelf - 44 3/4" x 25 3/4" x 38 1/4"
This is a great hydration cart. I'm happy that it also features a shelf. We used ours for almost all of our events and we are more than happy with our purchase.